cereal roots, damaging their ability to take up water and nutrients. Like all microbes, these pests are profoundly affected by soil moisture and temperature. How are these pathogens distributed among the climatic zones of the inland PNW? More importantly, how will they be distributed in future climate scenarios, and what impact will they have? Action taken: To answer this question, we first needed to establish a baseline: where are the pathogens now, and how does their distribution correlate with temperature and precipitation records of the last 30 years? 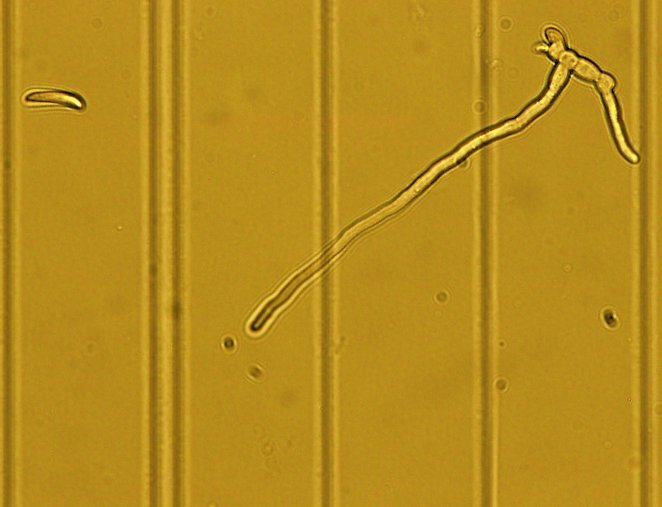 We developed DNA techniques to measure the populations of these pathogens directly from soil samples. We conducted extensive spatial surveys across eastern WA for three species of Rhizoctonia (cause of bare patch and root rot), two species of Fusarium (cause of crown rot), and Pratylenchus (root-lesion nematodes). We used various statistical methods to compare their distributions with spatial models of 30-year temperature and precipitation averages, scaled down to 4 kilometers. 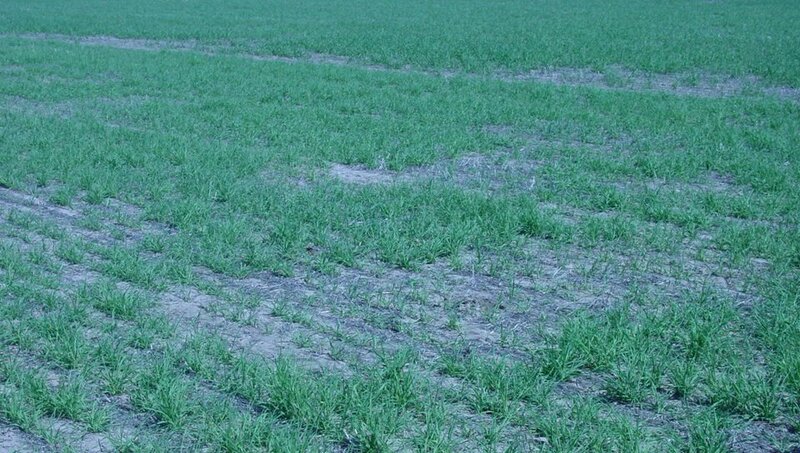 Results: We found that Rhizoctonia solani AG-8, the cause of bare patch, was somewhat correlated with sandier soils and> lower precipitation, concentrated in the wheat–fallow areas of Ritzville-Connell. Fusarium pseudograminearum was found more frequently in warmer areas with less precipitation (wheat–fallow zones) compared to Fusarium culmorum, which was found more frequently in cooler, higher-precipitation areas of annually cropped zones. The nematode Pratylenchus was more common in annually cropped zones than in wheat–fallow because it requires a living host to reproduce. Both of the fungal pathogens can grow on dead roots and crop residue and can survive in the absence of the host; hence, they are well adapted to cropping systems with fallow years or rotation crops such as legumes. These baseline studies provide a basis for future climatic modeling of these soilborne root pathogens. Kandel, S. L., R. W. Smiley, K. Garland-Campbell, A. A. Elling, J. Abatzoglou, D. Huggins, R. Rupp, and T. C. Paulitz. 2013. Relationship between climatic factors and distribution of Pratylenchus spp. in the dryland wheat production areas of Eastern Washington. Plant Disease 97: 1448–1456. Kandel, S. L., R. W. Smiley, K. Garland-Campbell, A. A. Elling, D. Huggins, and T. C. Paulitz. Spatial distribution of root lesion nematodes (Pratylenchus spp.) in a long-term no-till cropping system and their relationship with crop rotation, soil, and landscape properties. Plant Disease. Submitted. Okubara, P. A., K. L. Schroeder, J. T. Abatzoglou, and T. C. Paulitz. 2014. Agroecological factors correlated to soil DNA concentrations of Rhizoctonia in dryland wheat production zones of Washington state, USA. Phytopathology 104: 683–691. Poole, G. J., R. W. Smiley, C. Walker, D. Huggins, R. Rupp, J. Abatzoglou, K. Garland-Campbell, and T. C. Paulitz. 2013. Effect of climate on the distribution of Fusarium species causing crown rot of wheat in the Pacific Northwest of the US. Phytopathology 103: 1130–1140. A spore of Fusarium culmorum germinating at -9 MPa (-90 bars). The original spore has 4 cells, two of the cells have germinated to form a hypha, which can attack the plant root. For comparison, 1 bar is roughly 1 atmosphere or 15 pounds per square inch. At this water level, water is being held extremely tightly, making it very hard for most organisms to get the water and grow. How Do Temperature and Moisture Affect Fungal Pathogens of Wheat? Issue: To predict how soilborne fungal pathogens will be distributed under future climate scenarios in the inland Pacific Northwest, we need to know how they respond to temperature and moisture (water potential). However, nothing was known at a basic level of how the growth of two important pathogens, Fusarium and Rhizoctonia, was affected by these environmenta conditions. Action taken: With the development of new water potential measurement technologies by Decagon, we were able to experimentally vary the availability of water and grow Fusarium and Rhizoctonia under a combination of different water and temperature levels. We measured the growth of the fungi, the ability of their spores to germinate, and their ability to colonize straw pieces, which they can use as a food source in the soil. Results: Both Fusarium pseudograminearum and Fusarium culmorum (causes of crown rot) can grow under extremely dry conditions, down to -7 to -9 megapascals (MPa). This is extremely dry; plants permanently wilt at -1.5 MPa, and most fungi and bacteria cannot grow at this water level. On the other hand, species of Rhizoctonia (cause of bare patch and root rot) prefer wetter conditions and are restricted beyond -1 MPa. The optimum temperature for F. culmorum and R. solani is 20° to 25°C (68° to 77°F), whereas F. pseudograminearum and R. oryzae have optimums of 25° to 30°C (77° to 86°F). The fungi that cause Fusarium crown rot are adapted to growing under the dry soil conditions present during the summer growing season, whereas the Rhizoctonia species are more adapted to growing in wetter conditions in spring. This information will be useful for making distribution models of these pathogens under future climate-change scenarios. Aujla, I. S., and T. C. Paulitz. 2015. Effect of temperature and water potential on the hyphal growth rate of Fusarium and Rhizoctonia pathogens of wheat. Phytopathology 105: S4.9. Aujla, I., and C. T. Paulitz. 2016. Standardizing water potential of salt-amended growth media at different temperatures for microbial studies. Phytopathology 106: S4.30. Issue: Besides fungal pathogens, thousands of other species of fungi and bacteria are present in soil. Many of these play a beneficial role in helping plants take up nutrients and defend against disease. Fungi are especially important in the carbon cycle as decomposers of crop residue. Little is known about these microbial communities, but within the last decade tools have been developed that can produce tens of thousands of DNA sequences from a single soil sample, so we can identify thousands of microbe species. For the first time, we can look at the entire microbial community without having to culture microbes in the lab. Since no-till agriculture will be an important tool to mitigate climate change in the future (more carbon storage in the soil, less fossil fuel use, less erosion), we wanted to see if long-term, no-till cultivation would shift microbial populations, especially beneficial ones. Action taken: We sampled soils at two locations over two years, one near Pullman, WA, and one near Genesee, ID. At each location we sampled plots that had been in long-term no-till (12 and 30 years) and adjacent plots that were conventionally tilled. Using next-generation sequencing tools, we generated millions of DNA sequences of bacteria and fungi, which we identified and analyzed for abundance and diversity. 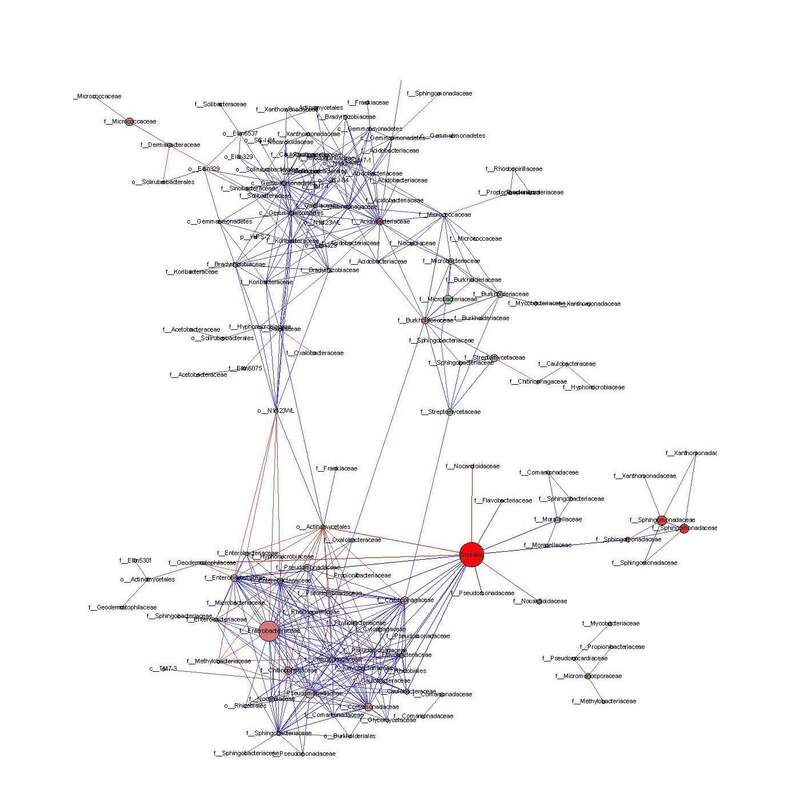 We also used network analysis to see how these groups were linked together and to further describe the community. Results: A few groups of bacteria were influenced by tillage, but most were not. The bacteria around the root were a distinct community compared to what was in the soil, and they were influenced even less by tillage. The plant was the primary determinant of this community, which feeds on carbon exuded from the root. On the other hand, fungal communities were much more influenced by tillage, and we identified distinct groups that were more dominant in no-till or conventional tillage plots. These differences may reflect the source of carbon. In conventional tillage, the residues are tilled into the soil, whereas in no-till, much of the carbon remains above ground, with root tissue being the main source of carbon in the soil. The fungal communities may play a role in suppressing Rhizoctonia, a fungal pathogen that seems to disappear in long-term no-till systems. Yin, C., S. H. Hulbert, K. L. Schroeder, O. Mavrodi, D. Mavrodi, A. Dhingra, W. F. Schillinger, and T. C. Paulitz. 2013. The role of bacterial communities in the natural suppression of Rhizoctonia bare patch of wheat (Triticum aestivum L.) Applied and Environmental Microbiology 79: 7428–7438. Yin, C., K. Schroeder, N. Mueth, A. Prescott, A. Dhingra, S. Hulbert, and T. C. Paulitz. Bacterial communities on wheat grown under long-term conventional tillage and no-till in the Pacific Northwest of the US. Phytobiome: Submitted. Barley yellow dwarf virus-infected wheat in southern Idaho. Issue: Both short-term and long-term water stress may become more frequent under a changing climate. Barley yellow dwarf virus affects wheat in some parts of the Pacific Northwest, but it was unknown how the pathogen interacts with these types of drought stress. Action taken: In a greenhouse study, we tested whether drought stress alters host-virus interactions of Barley yellow dwarf virus and wheat. We explored whether the interaction between water supply and pathogen infection affects host plant growth and seed set and what the consequences are when plants undergo drought and then recover. Results: We found significant interactions between host infection status and water quantity. In plants that received adequate water, uninfected plants set more seed, but in plants that received low amounts of water, infection status had no effect on the amount of seed set. In fact, in plants that were placed under water stress and then allowed to recover, infected plants surpassed uninfected plants in growth, seed set, seed germination frequency, and seed mass. Barley yellow dwarf virus and drought are both injurious to wheat, but their effects are not additive. Instead, infected wheat tolerates water stress better than uninfected wheat. Our findings suggest that yield projections under the dual stresses of drought and virus infection could be modified upward, influencing decisions about whether harvest is justified when both stresses occur simultaneously. Davis, T. S., N. A. Bosque-Pérez, N. E. Foote, T. Magney, and S. D. Eigenbrode. 2015. Environmentally dependent hostpathogen and vector-pathogen interactions in the Barley yellow dwarf virus pathosystem. Journal of Applied Ecology 52:1392–1401.